•	Register to vote. 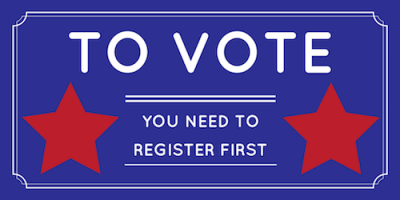 The deadline to register to vote in the Tuesday, June 5, 2018, primary is May 21st. You can do it on-line at fresnovote.com or go to the Fresno Elections office at 2221 Kern St from 8:30 a.m.-5 p.m. Monday through Friday. They have forms in 6 languages. •	Your vote does count. My friend lost her election for city council by 82 votes. This year, the possibility of turning out a reviled Congressman is the difference of 30,000 registered voters in his district. •	Go to local Candidate Forums, debates, political club meetings. I went to a televised debate two weeks ago with four gubernatorial candidates—two Democrats and two Republicans. Two of the major Democratic gubernatorial candidates may be back in Fresno on June 1 at a free reception. Go to fresnocountydemocrats.org for more info. I’m a member of five Democratic political clubs, all of which meet once a month and their nominal dues are only $20 per year. In election season, candidates speak at the meetings. Republicans also have local clubs. Hear the candidates speak for themselves and make your own assessment. •	Ask friends. My friend, Howard K. Watkins, sends out an email before each election called “Howard’s Hopefuls.” Left of my center, I know I won’t vote for all of his recommendations, but in the two races for judges this primary, I voted as he suggested since he is an attorney who knows the candidates. He’s a reliable friend I trust. •	Read the ballot booklet and newspapers. Before you get your ballot, you get a booklet in the mail with the candidate statements and issues. It can be daunting, but I do read (most) of it. The statements are written by the candidates themselves. I took the advice from the San Jose Mercury News recommendation this primary on Proposition 70. Educating yourself is key—and free. Don’t forget to have your friends read Kings Life Magazine-while they mostly stay away from politics, there are many social justice articles that can tie in to political issues. •	Watch who endorses. The booklet tells you which organizations like unions or lobbyists support a candidate or proposition. I notice patterns election after election. For instance, I know Howard Jarvis is an anti-tax group that has been around for decades and I personally usually steer clear of anything it endorses. •	Be self-interested. I am always shocked that people don’t vote in their self-interest, but by emotions. For instance, the proposed gas tax may sound bad if you are a trucker, but not so bad if your kid has asthma and the bad air in the Valley from car emissions hurts them. Remember, there is something called the common good; good roads, safe bridges and access to good schools, benefit us all. •	Get paid to volunteer on Election Day. Want to work at a poll on June 5? Go back to fresnovote.com and find out how. If you want to, instead, be on an election Observer Panel (watch the polls to make sure everything is fair), there are three trainings coming up you must attend. Call (559) 495-0606 or fresnocountydemocrats@yahoo[dot]com and more info can also be found for this on fresnovote.com but the deadline for this election is May 15. For those who live in CA but not in Fresno county here is a more general link to register to vote: registertovote.ca.gov. Editor’s note: While KRL doesn’t endorse any candidate or party, we want to encourage everyone to register and get out there and vote!